Music Notes: Signing up for Camp Freddy Welcome to Camp Freddy: a hard rock super-group cover band turned cherished getaway from the daily rock star grind. Their main lineup reads like a who’s who of hard rock. 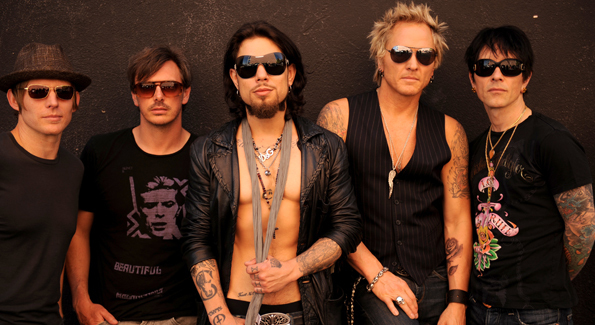 Mix a guitarist from Jane’s Addiction, Red Hot Chili Peppers and Nine Inch Nails together with a drummer from Guns N’ Roses and Velvet Revolver, plus a bassist who’s played with Slash and Alanis Morrisette, another guitarist who’s toured worldwide with The Cult and Billy Idol and even a former lead singer from Stone Temple Pilots. And sprinkle in legends like Steven Tyler, Mick Fleetwood, Sammy Hagar and many others to regularly jump on stage and jam. …cover songs? Why are these hard rock gods who’ve all collaborated on some of hard rock’s best tunes playing old tunes like Led Zeppelin‘s “Whole Lotta Love”, AC/DC‘s “Dirty Deeds” and David Bowie‘s “Ziggy Stardust”? Guitar ace Billy Morrison knows why; because it’s FUN. Now in their tenth year playing together, Camp Freddy, whose members are Morrison, Dave Navarro, Matt Sorum, Chris Cheney and Donovan Leitch, recently finished their fourth annual Christmastime residency at the famed Roxy on the Sunset Strip in L.A., they just played the world famous Whisky A Go Go, and are next headed towards DC to play a charity benefit for March 3rd at the 9:30 Club that benefits Rivers of Recovery, a disabled veterans rehabilitation organization. Then, in typical rock star fashion, they jet out to Vegas for the next gig. The affable, fully tatted Morrison, who called me from his car to talk about the band after getting a much needed cup a’ joe, elaborates on why this gig is such a good thing for him and his mates, why it’s a welcome alternative to the grind of being in a typical rock band. So how did this group of successsful hard rockers decide to band together and do this Camp Freddy thing? It wasn’t anything more than jamming at an L.A. party that started the whole thing off. Morrison’s primary job in addition to cranking out great guitar riffs is to hone the set lists for each show, a task largely based on who is an expected guest. Morrison knows how lucky he and his hard rock bandmates are to have been going this long as a supergroup cover band, a phenomenon that commonly doesn’t last but a couple years at best, if that. And Camp Freddy doesn’t show any signs of stopping their have-a-blast all-star rock shows any time soon. The Camp Freddy tour is presented by NBAGT Productions, LLC, a special events promotion and production company headed by Doug Davenport in Washington, DC, and Rob Stricker in New York City/Los Angeles, and Freddie Wyatt’s production company – Jamestown Entertainment. Check out Camp Freddy’s website here. Steve Houk is a TV executive in DC who is an ongoing contributor to vps3.washingtonlife.com, has his own blog at midliferocker.com, and also sings lead for his own cover band Second Wind.